The New York Jets are off to a 3-0 start after a big win against the Tennessee Titans. Fans are excited about their rookie quarterback and the possibility of bringing them to glory just like Broadway Joe Namath did in 1969. Jets QB Mark Sanchez jerseys are hot right now on eBay. 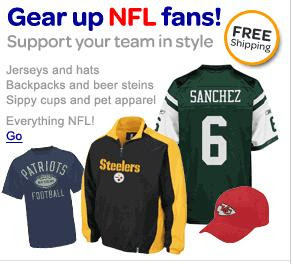 Out of one thousand,six-hundred and ninety-six current NFL players, eBay has a Mark Sanchez jersey displayed when you visit the Sports Memorabilia, Cards and Fan section of the worlds most popular auction web site. Upon doing a completed items search, the sell through rate on Sanchez Jerseys is very high with only a few jerseys going unsold. So what does this mean for eBay sellers? If the Jets stay hot and the Mark Sanchez fan base builds up across the country, this jersey will be hard to find around the holidays meaning it could bring in big bucks on eBay at Christmas time. As much as Jets fans dislike Brett Favre, we can only hope he becomes as popular as him. Brett Favre is currently the most searched term in the NFL section of eBay. Here is a quick video to show you a cheap way to ship jeans sold on eBay within the U.S. Most jeans weigh between 1-2 lbs when packaged and that could mean heavty shipping costs up to $8.70 with priority mail. Follow this video and you can save money on shipping and pass those savings on to your bidders which will mean higher closing auction prices. Thrift stores are great for finding used clothing at rock-bottom prices. One of the best finds at thrift stores are t-shirts. From vintage sports t-shirts to Hollister t-shirts the diversity is unlike anything you will find at your local department store. Here is a how to guide to make sure the shirt is worth buying. Check it over for stains. The best way to do this is bring the shirt near a window of the store in the natural day light. You can miss stains on darker shirts if you only look under the lights in the store. Smell under the arm pits. It may sound and look silly when you are doing it, but those smells are hard to get out and just makes the shirt a little less appealing and could effect your feedback once the buyer receives it. If the shirt is purchased at the Salvation Army, chances are the price tag was stapled onto the front of the shirt. If this is the case make sure the material can withstand the staple removal. The very thin cotton is though to remove without causing a rip in the shirt. The best way to remove the staple is to lift up both sides of the back of the staple up with a knife and gently pull the price tag forward away from the shirt. Stretch the shirt out and make sure there are no rips on the shirt. The most common places are the seams where the sleeve is sewn to the shirt, the underarms, the collar and the bottom of the shirt. If there are any loose threads do not worry. You can purchase a fabric shaver for a few bucks at your local drug store (Rite Aid, Walgreen's, etc.) It will easily remove those loose threads and improve the look of your shirt. After a good wash with a stain fighting laundry detergent, you are ready to list your shirt on eBay. These are not too hard to find at thrift stores. The best place to look is in the black t-shirt section of the store. They usually cost between a dollar or two. I have even purchased a few for .49 cents on half price days. It amazes me the stuff that I find at thrift stores. I have found Harley shirts in my New York City thrift store representing Harley dealerships from all over the country from Montana to Arkansas. I guess while Harley owners are hitting the open road, along the way they stop at every Harley Dealership to check out the apparel. I have included screenshots of two of my recent sales. Not too bad for a t-shirt purchased for less than $2.00. If you are avid thrift er you might want to hold on to the Harley tees and list them in a lot when you get a good group of shirts. I have seen lots of 8 used Harley shirts going for $150.00 and up. Hey Everyone, sorry it has been so long in between posts, but I was away in Alaska (my delayed honeymoon) for a few weeks and since I have returned I have been working long and hard on improving my eBay business http://www.asapsellsit.com/. But I am back now and ready to make this one of the best and most informative eBay blogs out there. Oh yeah before I get to the eBay stuff, if you ever have a chance to go to Alaska, DO IT. College textbooks are big sellers on half.com and here's the proof. I just purchased a Marketing Research textbook (shown above) for $2.00 at my a local thrift store. Listed it on half.com and it sold within 5 minutes for $65.00. Amazing. Selling used textbooks purchased at a thrift store can be tricky. If you do not have the current edition, chances are it really has no value to anyone, so you need to be careful. A lot of students these days usually sell their books back to the school. You have 3 ways play the Used Textbook Thrift Store Game. Go to half.com on your cell phone's browser and look up the book while at the thrift store. Make sure you are looking at the right edition. Take a Chance... Look at the copyright date and if it is within the last couple of years there is a good chance that the textbook is still being used at colleges today. The best thing about listing on half.com is you hardly have to do any work. The pictures are already there as well as all the info about your item. All you have to do is descrivbe the condition. Let me know if you find anything good or have any other good Thrift Store Book Stories.